Blue & Green & Yummy All Over! I am so blessed to live and work in a beautiful place with amazing people. I recently worked with the very talented, Miss Kimberly on her third son's nursery. I have to give her most of the credit because she really worked closely with me on every detail. 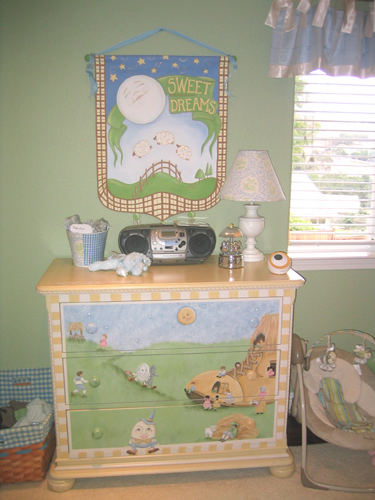 We started with a beautiful hand painted dresser she had and used it to pull our color palette and inspiration. I painted her a banner above it and her light fixture. The pails are from The Gifted Pail using our same fabric from the bedding and the crib set and diaper stacker we designed was made by my friend Trish, at Cottage Dreams. The valance we designed was made by my very talented seamstress, Lovely LaPrece. We also did a beautiful cradle set made of all MINKY and satin trim....prrrrrrrrr.....yummy! The cradle she bought at my boutique is by Bratt Decor. Thank you Kimberly for letting me come over and take pictures of the rooms and for sharing your beautiful baby with me. It was such a pleasure to be part of such a Magical time!